I am super excited to be celebrating the 50th anniversary of Honeycomb cereal with the creators of that awesome taste we all love! This week I made No Bake S’Mores Cheesecake Bars but I made the crust with Honeycomb cereal instead of graham crackers. Honeycomb cereal has been around since 1965, and that is no easy feat. 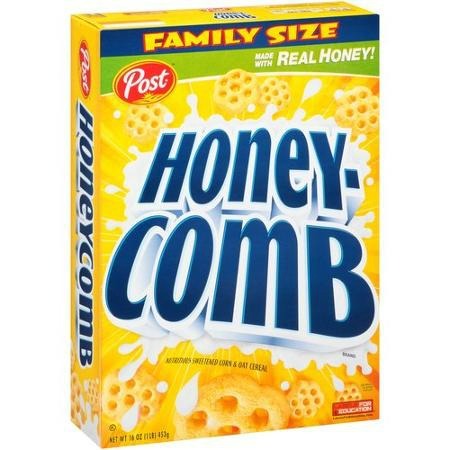 I eat cereal every morning before school and Honeycomb is one of my favorites. My mom is like the pickiest person ever about cereal (it has to have very few carbs, low fat, fewer calories, taste good, etc.) and she buys it all the time! Honeycomb definitely deserves a 50th anniversary celebration! I used mini-chocolate chips in the s’mores cheesecake bars. They seemed to fit in better than normal chocolate chips which would have taken over the bars. 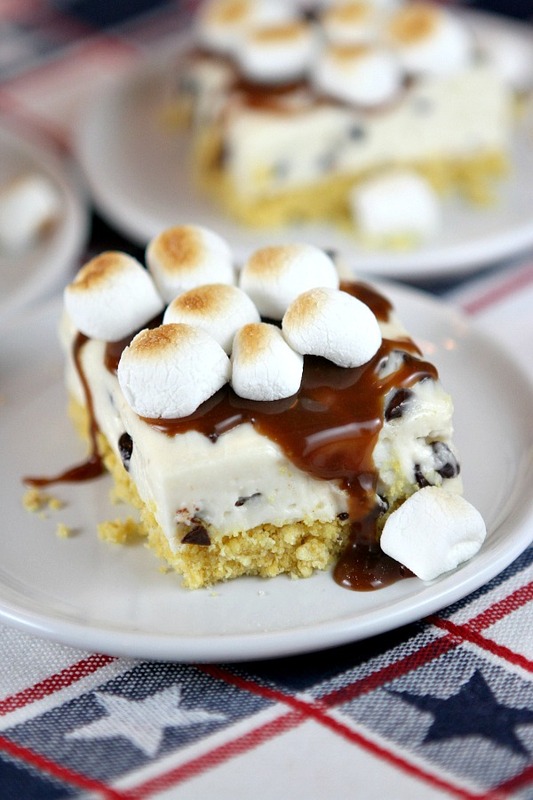 Even without marshmallows and hot fudge, the No Bake S’mores Cheesecake Bars were perfect! Overall, these bars were awesome. They looked epic and tasted out-of-this-world! They are perfect for 4th of July or just a delicious summer treat because you don’t even have to turn on the oven! The Honeycomb added a twist to the traditional s’mores taste, but it was for the better. It was more of a honey taste (as predicted) that fit well with the chocolate and marshmallows. 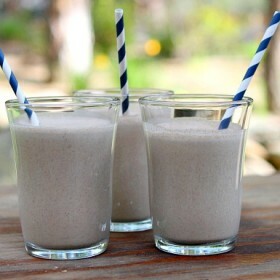 I would recommend making this recipe to anyone craving a yummy treat in the hot summer. And if you like cheesecake, this recipe is for you! 🙂 I hope everyone had a great Father’s Day! And even a kid can make a classic recipe into cheesecake… Like Me! Here's an easy dessert to make (no bake) when it's hot outside and you don't want to turn on the oven! 1. Make the crust: Line a 13x9-inch pan with foil, wax paper or parchment paper (you want it to hang over the sides because you'll be lifting the whole dessert out of the pan after you make it). In a medium bowl, combine the Honeycomb cereal crumbs, butter and sugar. Press the crumb mixture into the bottom of the lined pan. 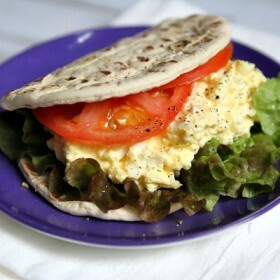 Place the pan in the refrigerator while you make the filling. 2. Make the filling: In a large bowl, use an electric mixer to combine the cream cheese, sugar and vanilla until creamy. Add the whipped topping and mix that in too. Stir in the chocolate chips. Spoon the filling mixture over the firmed-up crust and CAREFULLY spread it to the sides to make an even layer. Refrigerate for at least a couple of hours or until fairly firm. 3. 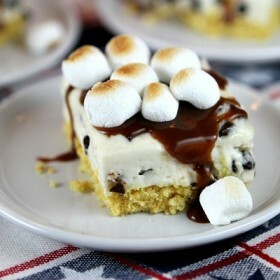 For serving, top with a drizzle of hot fudge and a few marshmallows. If you want the marshmallows toasted (totally optional), just place the serving plates under a pre-heated broiler for 30 seconds to 1 minute. Eat! Disclosure: I am working with Honeycomb Cereal to help promote their 50th anniversary. Perfection! 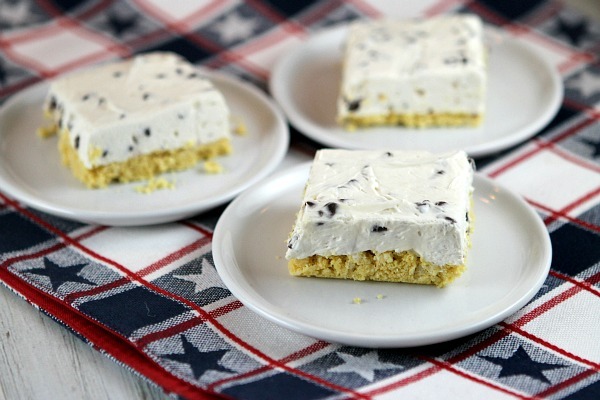 These will be on our menu for Fourth of July party! Good job, Recipe Boy! I’m getting together with friends this weekend, and they all love s’mores. They’d go crazy for this! Such a creative use for Honeycomb (YUM!!) 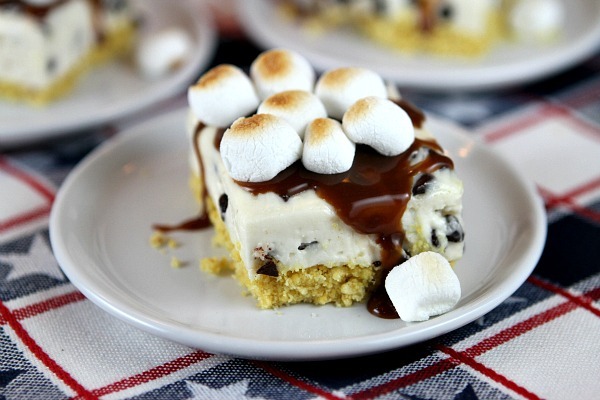 S’mores, cheesecake and no bake? Perfection! What am awesome idea! Love that you used Honeycombs! Whoa! These look awesome! Can’t wait to try them. What a great idea to use Honeycomb cereal! It’s getting too hot to bake, so I need to make these for my kids!